Mrs. Angelique Karekezi is the managing director of RWASHOSCCO LTD, Rwanda Small Holder Specialty Coffee Farmers Company. 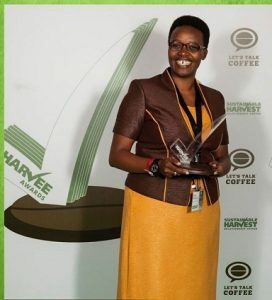 In 2008, Angelique transitioned from finance controller to the managing director of Rwashoscco where she currently, drives the overall company’s vision of marketing, roasting and exporting Rwanda’s specialty coffee. Prior to joining Rwashoscco, Angelique held various managerial positions in coffee cooperatives and occupied technical development of coffee farmer unions role at SPREAD USAID Project from 2003. Angelique holds Bachelor of Business Administration in economics and she is also the chairperson of International Women’s coffee alliance Rwanda Chapter. Angelique likes to drink her coffee black and without sugar. She affirms that’s the best way to taste the quality of coffee.